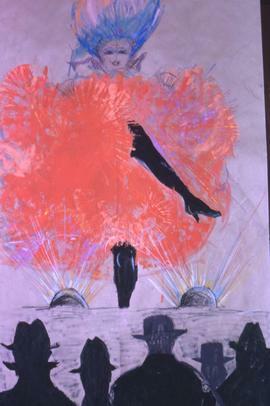 Colour Kodachrome II 35mm slide depicts a drawing of a cancan dancer wearing a pink skirt dancing on a stage with the shadows of an audience below her. 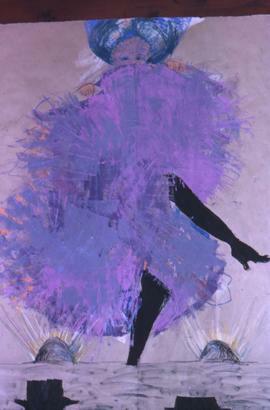 Colour Kodachrome II 35mm slide depicts a drawing of a cancan dancer wearing a purple skirt dancing on a stage. Colour Kodachrome II 35mm slide depicts a drawing of a cancan dancer wearing a yellow skirt dancing on a stage. Photograph depicts three unidentified people standing in the basket of a crane to light the Chanukiah.Written on the verso: "Eitz Chaim synagogue. 275-0007. 1989." Colour Kodachrome 35mm slide depicts five unknown men and three of the men are looking at a white poster with several categories on it. The category that is visible is the word "pool" and dollar amounts underneath it. Colour Kodachrome 35mm slide depicts five unknown men posing for the camera and there is a sign in the background that reads: "Ben Cole Pro".